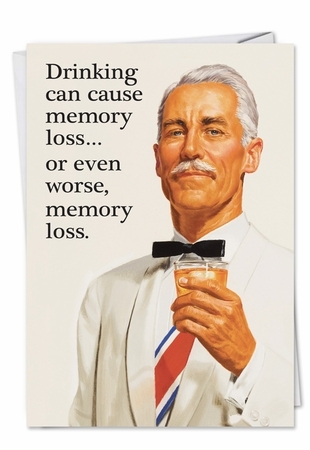 Humor May Cause Memory Loss Birthday Card Ephemera, Inc.
May Cause Memory Loss Funny Birthday Card by NobleWorks and Ephemera, inc.
And So Can Birthdays. Happy Birthday! Cover Reads: Drinking Can Cause Memory Loss, Or Even Worse, Memory Loss. Inside Reads: And So Can Birthdays. Happy Birthday! A card this funny isn't going to be forgotten, so pick it up before time runs out. Credit Line: Art by � Ephemera, inc.